The town of Silves, in Portugal’s Algarve region, has been inhabited since paleolithic times. Links to the past are found throughout the fortified town, from the imposing Moorish castle to the Roman bridge and the cathedral, which was originally built as a grand mosque before being converted into a church in the 13th century. In the late Middle Ages, Silves was of strategic importance and changed hands between Christian and Muslim rulers several times. Although nowadays the town has a sleepy feel, there’s plenty to see for visitors, especially those with a passion for the past. Aside from the historical buildings, Silves boasts many restaurants, cafés, and boutiques selling local products. Guided Algarve tours with experienced local guides are available for those interested in learning more about Silves’ history, or anyone simply wanting a convenient way to explore the region. Most tours also visit the spa town of Caldas de Monchique and head up Mt. Foia for spectacular views. Silves, with its ancient links, is a must for history buffs. Entry to Silves castle is via paid ticket. Silves’ old town has some steep cobbled streets that may not be suitable for wheelchair users. Silves is located 9 miles (15 kilometers) inland from the popular resort of Portimão. Access is via car or public transport; buses and trains link SIlves to Portimão, Lagos, and Faro. The Algarve region is busiest in summer, when many people head here on vacation—but bear in mind that inland towns can get very hot on summer days. That said, Portugal has a relatively mild climate, which makes it pleasant to visit Silves year-round. A short drive south of Silves, Portimão has some of the Algarve’s best-loved beaches. The picturesque Rock Beach (Praia da Rocha) is always popular with visitors in the summer months, while the huge Three Brothers Beach (Praia dos Três Irmãos) has room to spare. We will visit, part of the Natural Park of Ria Formosa (PNRF), one of the most beautiful natural patrimonies of the Country. 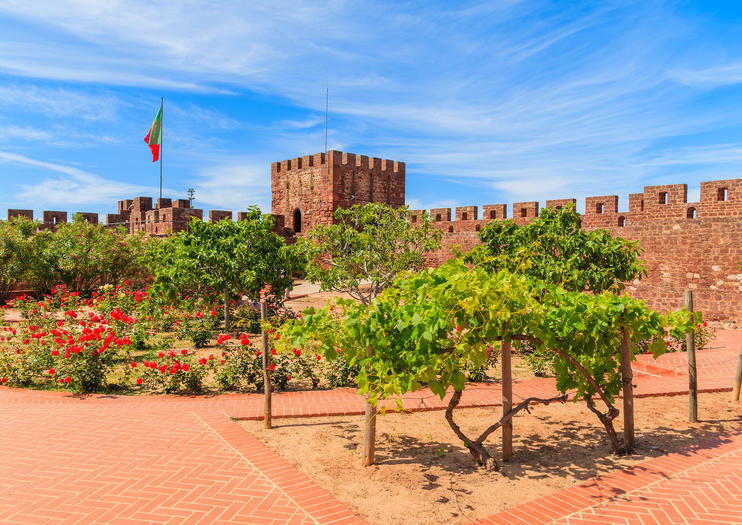 It covers an area of ​​18,400 hectares over 60 km, this place serves as habitat for several unique species, and there we find paradisiacal beaches.This tour also includes a visit to Silves Castle, of Islamic military architecture and one of the best preserved castles in the country. Get ready for a breathtaking view. Then we will continue to Foia, in the Serra de Monchique. Foia is the highest point in the Algarve, and here you will certainly be surprised by wonderful panoramic views. In the charming town of Lagos, historically linked to the Portuguese Discoveries, you can visit the church of Santo António and the Slave Market, from the 14th century.We will also visit Santa Luzia, a small fishing village located very close to Tavira, which specializes in octopus capture, and the cosmopolitan city of Faro - the capital of the Algarve. Take a tour to Silves and visit the stunning castle. Then explore the highest Mountain in the South of Portugal, with 360º views for all the Algarve! Explore southern Portugal’s most epic village on this immersive 4-day trip, departing from Lisbon by coach. With the help of your expert guide, tour the charismatic villages of Sagres, Évora, Lagos, Beja and Setúbal. While many travelers spend their time in Portugal's famous cities, get a dose of the laid-back and beautiful south on this trip. Go with your guide to Sé de Évora Cathedral and St Francis Church in UNESCO World Heritage-listed Évora, and discover the Sao Vicente Fortress in Sagres. Learn about the fascinating history behind these places with informative stories and historical anecdotes from your guide. Stroll picturesque countrysides and enjoy time on your own. Admire the stunning views of the dramatic Algarve coast, including the Ponta da Piedade cliff, Praia da Rocha beach in Portimao, and Serra da Arrábida Natural Park on this unforgettable hassle-free getaway. Discover the Algarve’s unique Moorish influences during this 5-hour guided day trip to the towns of Silves and Caldas de Monchique, departing from the Algarve. This tour uncovers the impressive 11th century Silves Castle, one of the best preserved Moorish fortifications in Portugal. After learning about Moorish history during pleasant walking tour, enjoy free time to explore Caldas de Monchique famous for its medicinal waters. Taste chorizo and local breads while you stroll the town filled with touches of Roman history. Plus, this Algarve half-day tour ascends to the top of Fóia where you can gaze at textured landscape. This tour is very pleasant as you can enjoy a natural landscape all along the river to Silves, the ancient capital of the Algarve, a village full of history. With a stop of 1 hour to stroll through Silves, we suggest visiting the Castle and the Cathedral Then we continue to make the descent to the river making small stops for beautiful photos.